If you’re on a budget, head to the city center to find lots of cheap eats fast. Try a pita, which is a special pie you can get in different flavors such as pumpkin, potato, cheese, or cheese and spinach. Dip yours in the spicy yogurt sauce for authenticity! You can also buy burek, a meat pie, pizza, and cevapi, a common fast food made from smaller sausages, lots of onions, and a pocket-style bread from any small Bosnian restaurants. There are so many restaurants to choose from in Sarajevo, and even if you bring our handy guide, you’ll be tempted every step of the way. For more traditional Bosnian dining, go to the old part of the town and try to blend in with the locals. You can find this restaurant near the Miljacka River. If you are craving traditional Bosnian foods—or Italian—you can find it here. Pasta, pizza, and main Bosnian dishes are all yours here! Stop in for a Mexican treat at this restaurant. The Hacienda has a late license, so have a nice dinner and then stay for drinks. Slightly more expensive fare is completely worth it at this intimate restaurant with fine dishes. Try a fish platter or a vegetarian meal if you’d like—they’re wonderful here. Head to this restaurant, located close to the National Library. Basenji, although slightly more expensive, has a great view and is easy to find. The dishes offered include both Bosnian and Italian food. Great views and even better views make this one of the top restaurants of moderate price. Stop by Tre Becchiari for Italian wines and a quiet, comfortable atmosphere. It’s one of the best Bosnian restaurants for wine available, and you’ll love the music. For the best cafes around, walk down to the Bascarsija district in Sarajevo. You’ll find traditional Bosnian outdoor cafes and restaurants surrounded by the wonderful Eastern architecture. If you have a sweet tooth, go to Fontana and buy cakes, fruit desserts, and sweet rolls along with a traditional strong, dark coffee. 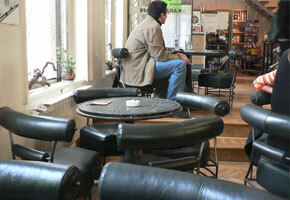 This centrally-located cafe has some of the best Italian coffee you can find in Sarajevo. If you need a pick-me-up, head to the center of town for traditional beverages in a young atmosphere. Head to Ferhadija, one of the main pedestrianized areas, to find a bar that suits you. Kinema is one bar that doesn’t have a strong local scene. It is very diverse, and with a young crowd, you’ll feel more comfortable if you don’t speak the language. Try this nightspot if you’re in the mood for drinking and dancing with a hip crowd. Despite the name, this cozy club really feels more like a bar.